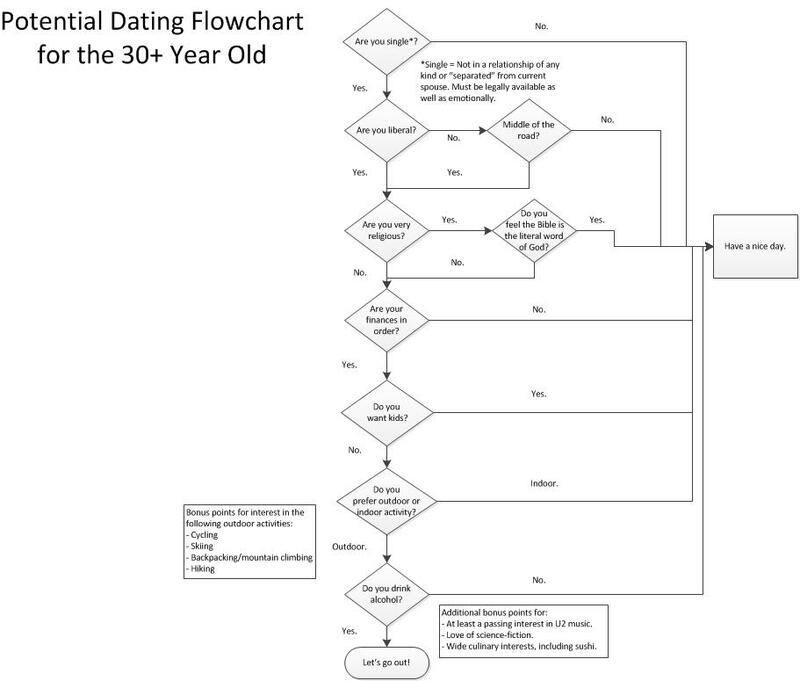 I crafted the flowchart below recently in considering my dating deal breakers. It’s funny because in the geeky inner workings of my brain, I actually thought out the hierarchy just like a flow chart with the more significant questions on the top to weed out immediately what characteristics I know won’t work with me. I distributed it jokingly among my friends just to test the waters and some of the more experienced among them found it quite a wise and practical thing for me to do. The way I look at it is, you should have a clear idea what you’re looking for before you head out into the wilderness of the dating world. This way you can avoid making costly mistakes (like I may have done in the past). A little re-evaluation time is good. Now… If only I can figure out a way to distribute to this to all the eligible bachelors between the ages of 35-45 in the Northeast Ohio area…. True, there’s always room for spontaneity. But I think asking these questions upfront saves a lot of time. This entry was posted in chick stuff, relationships. Bookmark the permalink. I love it! You need to walk through it on first dates, save both of you a lot of time. Craigslist or…if you can afford it…take out a 1/4 page ad in the newspaper =] It might make the news and then boom-cha! you’re famous for 15 minutes! I don’t want to date Bono in real life. Just want the opportunity to chat with him and tell him about how much his music saved my life and affected me. I’d love the opportunity to show him my sermon and to thank him for being awesome.